The other, while studying Sumo in Japan, Grandmaster Kim’s father (Dong Hwan Kim) had witnessed karate training and had been impressed by what he saw. He decided to end his son’s boxing career and in April of 1945 enrolled him in Grandmaster Hwang Kee’s Moo Duk Kwan Tang Soo Do Dojang in Seoul. Grandmaster Kim became a devoted and gifted student of Tang So Do under Grandmaster Hwang Kee’s firm leadership and iron discipline. In 1947 he earned his black belt. Grandmaster Hwang Kee’s training was rigorous and sometimes brutal. He required hard body conditioning through constant repetition. Students punched and kicked the Tal yun bong (makiwara) 100 times a day with each hand and foot, often leaving the board stained with blood. All students had Tal yun bong in their homes, Grandmaster Kim had two. Grandmaster Hwang Kee assigned “homework” and Grandmaster Kim was often up smashing the board well past midnight, sometimes to his neighbor’s chagrin. In 1952 Grandmaster Kim assisted in the formation of the Korean Tang Soo Do Association in Seoul, Korea. 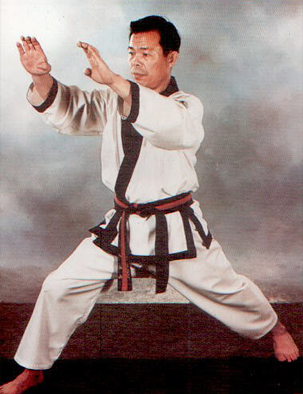 From 1955 to 1959 he was the top Master Instructor of Moo Duk Kwan in Korea. In 1955 he gave an exhibition at the 1st International Goodwill Tang Soo Do Tournament. As early as 1957, he taught Tang Soo Do to American G.I.s in Korea. In 1961, he was appointed Vice President of the Moo Duk Kwan Tang Soo Do Association and in 1962 was elected Vice President of the Korean Soo Bahk Do Association (the parent organization headed by Grandmaster Hwang Kee.) During 1967-1968 he was the Chief Master Instructor of Korean, U.S. and Vietnamese Special Forces. During this time he was awarded the 8th Dan and appointed president of the Moo Duk Kwan in the United States by Grandmaster Hwang Kee. He brought Moo Duk Kwan Tang Soo Do to the United States and founded the Association In Detroit, Michigan on June 8, 1969. Through the years, Grandmaster Kim toured the world for exhibitions and trained Master Instructors in Europe, Asia, North and South America and South Africa. Along the way he found time to train and promote Chuck Norris, Pat Johnson and World Heavyweight Boxing Champion Leon Spinks. Grandmaster Kim also instructed Detroit Mayor Coleman Young’s bodyguards. His selfless contributions to the community resulted in numerous proclamations from mayors around the country. Veteran martial artists will recognize that Grandmaster Jae Joon Kim held one of the highest ranks in Tang Soo Do in the world: in fact his Dan Number was #38, which was awarded by Grandmaster Hwang Kee (the founder of Tang Soo Do.) For over 50 years Grandmaster Kim had been a devoted teacher and inspiration to all who came in contact with him. He was at his happiest when surrounded by the children who seemed to gravitate to him wherever he went. He ensured that his students and his instructors received the finest instruction possible through the art of Tang Soo Do as a way to health in both mind and body. the Korean Art of Tang Soo Do for all.